please bookmark this tab and stay in the know on all things essential, this season. remember that we are a paper free studio- ALL information and communication is virtual. Please Visit this page Often, during the 2018-19 Season for ever updating info and details for your Essential Mover. Scroll to the bottom of this page for Easy Essential SquareMarketplace payment links: Classic Tuition and Recital Fees. APRIL BEGINS THE START OF TWO AND A HALF MONTHS OF ESSENTIAL RECITAL PREP FOR ALL OF OUR STAFF AND STUDENTS. PLEASE VISIT THIS PAGE OFTEN TO REMIND YOURSELF OF IMPORTANT DATES……APRIL AND MAY ARE CHOCK FULL OF THEM. APRIL HAS ARRIVED!!!! HAVE A FANTASTIC DAY. APRIL HAS ARRIVED…OUR COMPANY KIDS BEGIN WORK ON OUR 2019 OPENING NUMBER, THIS MONTH. Smaller classes at Essential Elements offer a one on one educational experience. Registration for both our Summer and Fall Classes are now open. Contact the studio 732-769-2219 or EEDancestudio@gmail.com for full details for your dancer. Classes for the Seventh EEDS Season will close on January 1, 2020 to ensure optimal growth for each student. There may still be room for your dancer to find her new home with us, at EEDS. Contact Us Today. DON’T MISS OUT ON OUT ON OUR ESSENTIAL EVES OF DANCE, SUN AND SKY CAMPS, OR OUR BI YEARLY IN STUDIO SUMMER INTENSIVE. FULL DETAILS BELOW ON OUR AMAZING SUMMER OPPORTUNITIES FOR ALL DANCERS. At Essential Elements, we encourage the growth of all of our students. We offer outside guest artist classes throughout the season. ADDITIONALLY, we work toward affording students additional opportunities through Scholarships and Gifts at our Annual Recital Experience. At our recital experience in june, to commemorate our FIFTH Season, there were multiple gift raffles at each of the shows. Including Complimentary Tuition, Summer Class Experiences, Complimentary Costume and Recital Fees for Season Six. Congratulations to all of our Winners!!!!! View our 2019 Virtual Recital Pac, above. Tap on the image to view, several pages of important info to keep on hand during the hectic season ahead. SEE BELOW FOR YOUR ESSENTIAL RECITAL GIFTING NEEDS…WHEN POSSIBLY, PLEASE STAY ESSENTIALLY GREEN AND RETURN ORDERS BY SCANNING AND RETURNING TO EEDANCESTUDIO@GMAIL.COM VIRTUALLY. PLEASE CLICK ON IMAGES BELOW. YOU MAY ALSO PRINT AND RETURN IN THE STUDIO WITH PAYMENT IN CASH OR CHECK. DON’T FORGET YOUR DANCER ON RECITAL WEEKEND!!! ALL ESSENTIAL GIFTING ARRIVES IN ON BRAND ECO FRIENDLY WRAP. PLEASE NOTE PICK UP PREFERENCE IN THE NOTES ON YOUR ORDER. MIA KITSON, our 2018 Effort. Excellence. Award Recipient. Mia had a stellar season of growth during season five. Mia was an ORIGINAL mover at the studio and has become an energetic learner in the past five years. She is little, but she is mighty- and is the SOLE awardee, this season. Congratulations, Beautiful. Your growing excitement for classes and learning are EXACTLY what this award is about! THANK YOU TO THE FAMILIES THAT JOINED US FOR THESE AMAZING INCENTIVES ON YOUR DANCER’S EDUCATION FOR SEASON SEVEN. SEASON SIX RATES HAVE NOW EXPIRED. TICKETING CHOICE VIA ASSIGNED TIME ON APRIL 16 AND 18TH, PLEASE CHECK YOUR INBOX IF YOUR FAMILY PREREGISTERED. ALL DANCERS RECEIVE A RECITAL SHIRT WITHIN YOUR RECITAL FEE. THESE SHIRTS ARE WORN IN OUR FINALE AT THE END OF EACH SHOW. DANCERS WILL PROVIDE BOTTOMS (TBA MAY 2019). 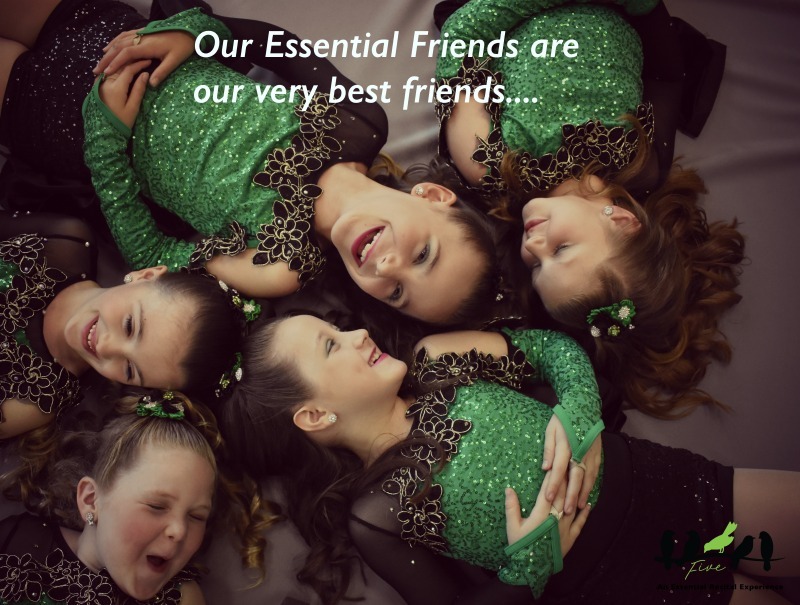 ADDITIONAL ESSENTIAL DANCE/GIFTS AVAILABLE FOR RECITAL DAY GIFTING FOR YOUR PERFORMER. THESE ITEMS ARE AVAILABLE FOR PRE ORDER (AND ARRIVE IN RECITAL BRAND WRAP)- THE ESSENTIAL WAY TO LET YOU DANCER YOU ARE SUPPORTING THE HARD WORK PUT IN ALL SEASON LONG. CHECK YOUR INBOX IN APRIL. We proudly presented Grace Hatton and Alison Sullivan with this inaugural Essential Elements Award in 2016. Both girls have been students since we opened our doors in 2013 and are wonderful examples to their EEDS family. Grace and Ali passed their torch to our second recipients, Sienna Ulrich and Ava Guarcello, at FOUR- our 2017 Recital Experience. Congratulations, Ladies! We continue to marvel at your growth and technical advances. We are so very proud of you!!! Cottonwool, March 2019 Trenton. IDA People’s Choice Award. HAIRSPRAY, ATTICUS 2019. Award Winning Choreography by EEDS Faculty, Elliott Bradley. Essential Elements: not your ordinary COSTUME experience. Costume Week is quickly approaching…All parents return 15 minutes early for pick up: APRIL 27th- MAY 3rd. ALL ACCOUNTS MUST BE CURRENT FOR RELEASE OF COSTUMES. Thank you. PHOTO WEEK FOLLOWS IMMEDIATELY: May 6th-May 11th. Please See Schedule in your Virtual Recital Pac, 2019.
essential summer experiences, 2019. join us! !